My name is Edward Martin, and I am a retired professor of biology. I'm very concerned about the community and the harm that may come to it by the propagation of bad science and ignorance. I am interested in global warming - or rather, attempting to correct the myth of global warming. To this end, I have created a website (http://www.ausclimate.com/) about the truth behind global warming. Please check it out and email me your opinions. Is there Global Warming on Mars? something's amiss with your page - pix missing, link leads to "This web page is not available." The link works fine for me, which on the whole was a disappointment. Welcome to the forums. You'll find some on here who think the way you do. "In the late eighties, US summers were exceptionally warm..."
As other links on this subject on this forum (I can't be bothered to look for them but Bunbury started a thread with a good one recently) have said, and as I recall from having lived through that period, global warming was investigated first in the 1970s, and reports were produced that governments took seriously (seriously enough in some cases to be motivated by economics to suppress or do their best to deny) before the '80s. This evidence has since then only been added to, not refuted, despite improvements in methodology that are being claimed by global warming deniers to be contradictions (by comparison, see how Creationists claim that every disagreement between evolutionary scientists is "the end of the thoery of evolution"). This opening statement, therefore, does not bode well for the scientific validity of your notions: if you can't even get the history right, what reliance can we place upon other evidence you claim to provide? The density of misinformation and fallacies must be a dazzling record breaking for the guiness book of world records in the post above this. why not join the Yahoo Climate sceptics group. There you can discuss with many renowned specialists, instead of enduring the groupthink here. I know you will be admitted, since I'm doing that myself as moderator. There's no doubt about it at all. Serious consideration of global warming began in the 70's, a culmination of hypothesis that started in the 19th century, grew in concern (even Rachel Carlson mentions it), and finally became viable for serious study with the advent of good enough computers to support good data analysis and models. Here's a study of the studies from the 70's, where there were already more papers supporting warming than the media hyped "cooling." The was well before the IPCC, any 80's warming or anything of the sort. "But Thomas Peterson of the National Climatic Data Center surveyed dozens of peer-reviewed scientific articles from 1965 to 1979 and found that only seven supported global cooling, while 44 predicted warming. Peterson says 20 others were neutral in their assessments of climate trends." But I know, but challenging your historical revisions...you just think I'm spouting "groupthink," LOL. That instinctive response of yours every time the questions get difficult or when confronted with a fact--it's easier than being objective, or make good argument. It's also utterly unconvincing. Sorry you're flat wrong on this. Let's say that the "evidence" for global warming has totally evaporated, so the claim that it has accumulated is beyond any reason. #9 Also . . . check this out. 2. the Heating-Up of our atmosphere / envirement causes GLACIERS to melt, causing a sort-of "ice-water" effect on the Ocean, causing certain Regions of the Ocean to be colder than normal -- IN EFFECT, this "throws off" all kinds of Oceanic-species throughout the sea; which, long-term effect could throw off the whole food-chain. . .
3. if it ever occured that we actually tried to cut-down on o-zone heating gases. . .we might have a chance, but due to all the commerce/businesses, i dont think people really care enough to give it a shot. but even STILL, i do not think it would give us enough time to work with to be of any relevancy towards to world. 4. and i'm sure that like me, most of you probably realize we're headed into a long and dusty road into the future; facing unknown issues and problems. I have no doubt the Earth's temperature is rising, What I don't believe is that we are the reason why. For one, the Earth has a Climatic cycle which it goes through, Ice age, Tropical age, Ice Age, Tropical age... And the latest ice age ended about 50,000 years ago, meaning Earth's temperature is now on the rise. Around 98.5% of all the Carbon Dioxide on Earth is created by Volcanoes, along with all the other noxious gasses volcanoes release into the atmosphere. As the Earth's core is affected by the Galactic Core's gravity field, Volcanic activity differs, when activity is low it results in a Ice Age, and when it is high it results in a Tropical age. The amount of Co2 released by Fossil fuel Vehicles is on only slightly larger then the amount of Co2 created by every Oxygen breathing life forms exhale, which has little effect on the Global climate as a whole. In a smaller scale the effects from the vehicles is of course large, as well as any fossil fuel power plant. Being Environmentally is very good, in fact there is no reason not to be, but "Global Warming" is merely an over used term used to scare people into being environmentally friendly and has been thrown into many educational system. Dude, I also believe in global warming, but even I as a non-scientist can see some glaring mistakes in your post. But in the Earths History it has a pattern of different climate ages, one which had ended only recently so the temperatures on earth are starting to raise, and would regardless of are existence on Earth or not. I mean people have enough trouble changing small aspects of the Earth, let alone Global Climate. I mean people have enough trouble changing small aspects of the Earth, let alone Global Climate. People have always changed vast aspects of the Earth. Where do you get the idea we have trouble doing it? Have you ever looked out over the English countryside? There's nothing there that hasn't been changed by man, except in some of the more remote spots. Even the forests of America have been hugely changed, first by Indians using controlled burning, then by Europeans by various management practices. Look anywhere, the Indonesian rainforest, Easter Island, Hawaii, Australia, everywhere man goes he changes the Earth. Invasive plants, introduced to north America as ornamental garden plants, are reshaping the riparian ecosystem of our own Arkansas river in Colorado. Far from having trouble, it is very easy for people to intentionally or unintentionally change huge aspects of the Earth, let alone small ones. Yeah but thats large from a human perspective, I mean we change vast environments by destroying life forms. But we can barely predict the weather, and can only make clouds rain, I doubt that we changed the entire Earth's Climate. I mean I'm all for environmentally friendly things, using cleaner power and other things, I just don't think we are the reason Earth's climate is changing. If you have read anything about climatology you surely know that predicting the weather next week and predicting the climate decades into the future are entirely different things, and poor accuracy in the former does not say anything about the latter. I just don't think we are the reason Earth's climate is changing. Does a professor of geology automatically make him a good and credible climatologist or meteorologist? Also, this PDF is suspiciously void of any citations. Can you provide them? What does the actual paper say. The link is to a page which seems to be a third parties interpretation of Dr. Easterbrooks GSA presentation. Easterbrook, D.J., 2005, Causes and effects of abrupt, global, climate changes and global warming: Geological Society of America, Abstracts with Program, v.
As you can see it was in 2005 and unless someone has access to the official abstracts I would not take the link provided by Andre without a large grain of salt. It's an abstract in preparation of a (poster?) presentation at the GSA meeting, unusual to put in refs in there. Don't worry they will be available for scrutiny at the presentation. 1: Illusion of Invulnerability: Members ignore obvious danger, take extreme risk, and are overly optimistic. 2: Collective Rationalization: Members discredit and explain away warning contrary to group thinking. 3: Illusion of Morality: Members believe their decisions are morally correct, ignoring the ethical consequences of their decisions. 4: Excessive Stereotyping:The group constructs negative sterotypes of rivals outside the group. 5: Pressure for Conformity: Members pressure any in the group who express arguments against the group's stereotypes, illusions, or commitments, viewing such opposition as disloyalty. 6: Self-Censorship: Members withhold their dissenting views and counter-arguments. 7: Illusion of Unanimity: Members perceive falsely that everyone agrees with the group's decision; silence is seen as consent. 8: Mindguards: Some members appoint themselves to the role of protecting the group from adverse information that might threaten group complacency. In a Geological Society of America abstract, Dr. Don Easterbrook, Professor of Geology at Western Washington University, presents data showing that the global warming cycle from 1977 to 1998 is now over and we have entered into a new global cooling period that should last for the next three decades. Let's hope the professor is right. A temporary natural cooling effect to offset man-made warming would at least give us some breathing space to plan for the future. It should of course be recognized as merely hiding the effect of fossil fuel burning, not removing it. 1) How robust is the correlation between the PDO switch to "cool" and global temperatures? 2) How has Dr. Easterbrook determined that the current cool phase will mimic the previous one in temperature, surface area and duration? As you and Kalster point out this is a problem. Even off his web page, of the four "papers" I checked none of them turned up in journals even years after the conference. Typically scientist will publish their research in peer review journals after one or two conferences. I agree, take with a huge grain of salt anyone unwilling to subject themselves to the peer-review process. And if he if actually publishing in peer review journals than why doesn't he list them on his home page? As for the cooling though, he might appear correct for a while, not due to Pacific multi decades oscillations(which are far from even a certain phenomena), but because growing economies of Asia are doing little to restrict their particulate pollutions (remember the Olympics). Much like the explosion of European dirty fossil fuel burning after WWII, the particulate pollution will masks the Co2 heating for a while until these counties are forced to clean up their emissions. First off, considering this is the first time we have ever interacted, I find it rather insulting that you would claim I am exhibiting Groupthink. This is the same as if I had called you paranoid and delusional. However I have not and will not because I try to maintain civility in my discussions whether face to face or on a forum. Second. I did look at Dr. Easterbrooks page and specifically his list of publications. none of which have been published later then 2005.
simple, the incredible densisty of fallacies, including that last one is substantially above international average and the automatic attempts to discredit anybody thinking freely, are the most splendid symptoms of groupthink. Considering of the source is a logical thing to do when evaluating the credibility of an argument--especially when it directly bares of that argument. Here we're being asked to hold some non-peer review "unpublisheed" articles as more worthy than the science, and acused of "group think" if we don't trust them to the same level. It's not a matter of autmatically discrediting the author, it's a matter of evaluating the source based of his own willingness to participate in the science. If you only believe peer reviewed publications, why not believe Chilingar et al 2008? Here is another example of groupthink. How come that Pauchari doesn't know the truth? Just check out the symtoms. Concerning that little club down here of which I'm the janitor and gatekeeper, it's size has doubled the last three years. And what does this have to do with Easterbrook? Nothing. Where are the meteorologist? Where are the climatologist? If a scientist really wants to be considered credible as making a worthy contribution as a scientist they have to expose themselves to peer review within that science. That doesn't mean everything else is junk necessarily, but it certainly means they should be viewed with an extra pound of salt. You do understand that--don't you? There actually are a few good atmospheric scientist that still doubt the magnitude of man-made sources in the future. Why you don't use them I really don't know. Fortunately there are enough actual scientist or critical thinkings in these forums to tell the difference between the questionable materials you usually post and the sources actually worth consideration. It makes me think you really don't have a sincere interest in exploring this science. Not wondering why the Realclimate team never tore Chilingar et al apart? The world has never seen such freezing heat. ...The error was so glaring that when it was reported on the two blogs - run by the US meteorologist Anthony Watts and Steve McIntyre, the Canadian computer analyst who won fame for his expert debunking of the notorious "hockey stick" graph - GISS began hastily revising its figures. This only made the confusion worse because, to compensate for the lowered temperatures in Russia, GISS claimed to have discovered a new "hotspot" in the Arctic - in a month when satellite images were showing Arctic sea-ice recovering so fast from its summer melt that three weeks ago it was 30 per cent more extensive than at the same time last year. A GISS spokesman lamely explained that the reason for the error in the Russian figures was that they were obtained from another body, and that GISS did not have resources to exercise proper quality control over the data it was supplied with. This is an astonishing admission: the figures published by Dr Hansen's institute are not only one of the four data sets that the UN's Intergovernmental Panel on Climate Change (IPCC) relies on to promote its case for global warming, but they are the most widely quoted, since they consistently show higher temperatures than the others. Note that an important part of groupthink is that one is darn sure that one is right. So no reason to raise an eyebrow when October seems to be at an all time high. That's exactly what one is expecting. But with many hawks now sharply monitoring, the spinning finally gets exposed to everybody. But with many hawks now sharply monitoring, the spinning finally gets exposed to everybody. Haven't you been saying this for some years now? And if it were true there wouldn't be so much transparency to the process that data was available for many external groups to analyze with just a couple days of the end of the month--nor would problems be immediately corrected. The National Climatic Data Center will post their monthly report early next week. what do you mean making clouds and rains???? He means with corrected data it only turned out to be the 2nd hottest month on record instead of the warmest. LOL. "October 2008 ranked as the second warmest October since records began in 1880 for combined global land and ocean surface temperatures, behind 2003. Temperatures were warmer than average across Asia, Australia, Europe, and northern Canada, prompting the October 2008 global land surface anomalies to be the warmest on record. The global average ocean surface temperature (SST) in October was the sixth warmest on record." First, I believe that humans are responsible for the majority of the warming. But let us assume that that is incorrect and the changes are due to a natural Earth/Sun cycle. What can be the harm in assuming the worst and trying to do something about the pollution that we are pouring into the atmosphere from coal and oil burning? Aside from added expense, even if it is considerable, what can be the harm in cutting pollution and looking more vigorously for alternative energy sources? I'd rather be safe that sorry. Of course, it does assume that one cares about our home here (the Earth) and the desire to see that all life forms (not just humans) have a chance to thrive here like we humans in the First World have done. Shown in thin lines are the monthly averages while the thick lines represent 12 months running averages. See how NASA creeps up, whereas Jones et al of the UK met office holds the midgrounds between Hansen and the two satellite temperature sets, both with a robust fit of the 12 months running mean. Oh and the Alps and South Germany expect 3-4 feet of snow in the coming weekend. Ok. 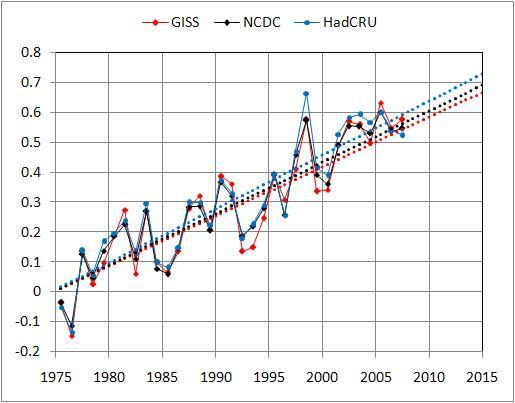 So Hansens analysis doesn't look quite as warm as the National Climatic Data Center's calculation, even though if there really was group think and manipulation it should be warmer. That doesn't make your point very well. In reality they both say the same thing--this was one of the warmest Octobers on record going back 120 years. All four temps show increases that aren't that far off the NASA surface data temp trend. UAH rises a bit slower because its interpretations of satellite data IR band frequencies inevitably include some measurement of temperature well above the surface. We've covered this before. And Somewhere this winter it will be particularly warm. Do you have a reason that you think we'll put much credence into anecdotal evidence over a small regions weekend weather as compared to the global average? It's meaningless weather trivia haven't nothing to do with the subject of climate change. But getging back to the thread. Data was released to public for review within days at the end of the month. A simple file loading error was discovered and fixed. Science as it should be--pretty much the opposite of what we'd expect from group think. Actually you can say that. HADCRU is almost always is lower than the NASA--it's a systemic difference. The trend, which is what we're after here, is nearly identical. All satellite interpreted temps are also heavily adjusted in attempts to remove mid troposphere measurement--it's a lot better than nothing over a large but shouldn't be compared to direct surface measurement. And as I said before, all the techniques of measuring data show an upward trend so it doesn't really matter all that much. I hope you're joking. If we didn't have seasons that might be a good way to look at it. All satellite interpreted temps are also heavily adjusted in attempts to remove mid troposphere measurement-. What's heavily? 2%, 0.5%? What is the resulting error? 0.0001 degrees, 0.001 degrees? Download the data and do the "rank" function and see for yourself. It's also time to do some verification of earlier predictions. Remember the three scenarios of Hanssen 1988, Scenario A business as usual, continuing CO2 emissions at the rate of that moment, scenario B with moderate restrictions on the CO2 emissions and scenario C with draconical cutting of the emissions. Let's compare those with the 12 months running means of his own GISS temperature series, and the satellite series of RSS which is near identical with UAH. Both series are vertically displaced to start in the middle between scenario A and scenario B. How much more do we need to conclude that Hansen was a tad "pessimistic", to say it very kindly? Unfortunately I now realize you wentn't kidding. Ok, I'll explain. You can't compare the month to all months because they include seasonal variations. If, for example, you looked at a warm January in the same why you tried to look at October, you could make some bold statement that is ranked among the coldest 8% of all months in the North Hemisphere and give the completely wrong impression that it was a cold January. Of course the group that contained that 8% would be mostly other January temperatures. At the global scale the Northern Hemisphere summer is notably warmer than the Southern Hemispheric Summer thus there's still a strong seasonal signal. The seasonal signal (e.g. it's cold in the winter hot in the summer) would overwelm any other meaningful comparison. You understand now? This is why comparing any particular month to all possible months makes absolutely no sense. So what pollution are we pouring into the atmosphere? Worst case sanero is what 1-2 degrees? Won't warming be most benificial for all life? What can you do to stop changes in the atmosphere? Do you know how to make it rain or stop the rain? Can you change the course of a tornado? Can you predict where next tornado is going to be and which way it will go? What kind of power do wield there Navar? So what pollution are we pouring into the atmosphere? Worst case sanero is what 1-2 degrees? Won't warming be most benificial for all life? not so beneficial, is it, unless you would like to call the culling of elderly people beneficial ? More people die due to cold than heat. has nothing to do with consolation. So is global warming scare to make people feel better regardless of the facts. interesting hypothesis, we'll test it tomorrow. So if we hypothetically increase both summer and winter temperatures then the loss increase in summer is more than compensated for the reduction in loss in winter time. Nevertheless smart move to make warming look bad. Main problem though is that the projected warming of Hansen stubbornly refuses to come. If your argument is that a warmer world kills fewer people than a colder world, then it becomes obvious that your focus is not on ecological health at all, which undermines any credibility you may have to discuss whether policy shifts are warranted. P'raps I'll light my house on fire the next time it's a chilly night, would be better than freezing to death. This is what it's all about. Hansen was wrong. Period. It's not about lame suggestions about credibilities. How fallatic can you get. Dear lad, have you not heard of multidecadal cycles; a flat or cool trend for some years now is not surprising given the past such multidecadal oscillations. You may remember a cooling trend around 1940-1970, followed by warming 1970 until 2000. Your hysteria over 'red herrings' would be as well placed in 1948 as it is in 2008. The overall trend is upwards, not downwards, multidecadal oscillations notwithtanding. Heavily as in 100%. The satellites take no direct measurement of temperatures at the surface--it's all derived by remote sensing. They look at the amount of IR radiation received at specific frequencies, make adjustments to account for angle and thickness of atmosphere the reading is taken from, amount of dust on the sensors etc than run them through a series of algorithms using certain assumptions such as cloud optical thickness, albedo, vegetation amount etc to derive an approximate temperature at different levels. To compound the challenges of the cloud and surface parameters are particularly problematic at high-latitudes were both the models predict and direct temperature measurements show the greatest increases. This is why satellite derived surface temperature increases are less, and sometimes inconsistent with the direct surface measurements. If you look at the direct surface measurements from the three agencies that calculate the averages, you see the trend increase is pretty clear. Also note that your so called "group thinking" NASA GISS is actually the lowest here. The chart doesn't include 2008 because this year isn't complete yet, including the particularly warm October we had last month. The satellites take no direct measurement of temperatures at the surface--it's all derived by remote sensing. They look at the amount of IR radiation received at specific frequencies, make adjustments to account for angle and thickness of atmosphere the reading is taken from, amount of dust on the sensors etc than run them through a series of algorithms using certain assumptions such as cloud optical thickness, albedo, vegetation amount etc to derive an approximate temperature at different levels. To compound the challenges of the cloud and surface parameters are particularly problematic at high-latitudes were both the models predict and direct temperature measurements show the greatest increases. This is why satellite derived surface temperature increases are less, and sometimes inconsistent with the direct surface measurements. Interesting and educational. Your other posts too. They make the thread worth reading. By the tone of your reply I can tell you are trying to pick a fight but sorry, I won't oblige. I don't use the internet for arguing. I ask questions, read posts to get information, try to help others (if I can), and occasionally I will give my views on a subject. You'll have to find someone else to attack. the reason why i hate to contribute to climate change threads is that the whole issue has become so polarised that you can't disagree with anyone's statements without being tarred by some sort of stereotype such as "petroleum industry puppet" or "Hansen's stooge"
@Nevar. I'm not armed for a battle but I'd answer your question "what harm" with my own speculation. You mentioned the pollution that we are pouring into the atmosphere from coal and oil burning. I don't believe this is a good thing either and I'd like to see it reduced. However I suspect our pollution may have delayed the consequence of another human caused problem. This other problem is that natural aerosols necessary to cloud formation are suppressed by human activity, on a grand scale: agriculture, erosion control, forest fire suppression. Basically we're at war against dry soil, dust, and fire and we're winning. We've locked down huge swaths of formerly marginal land, because it's perfect for pasture and cereal crops. We don't allow naturally occurring forest fires to spread and smog up the summer air as they once did. But dust is a key ingredient the system cannot balance without. Naturally, warming causes marginal land to ...well, think of the Dust Bowl... think of when forest fire risk goes up... and that in turn promotes clouds... those clouds of course reflect sunlight and solve the problem. I fear that we have already deprived the Earth of this natural check to such extent that man made aerosols may be necessary. The harm then is that by pulling out this artificial check, the climate may turn hot/cloudless at a pace to match our desperate "solution" to global warming. And yet we'd simultaneously combat desertification e.g. Dust Bowls all the way to hell. Why didn't Hansen tell that when he did that prediction in 1988? A rather underwhelming difference of 0.03 C between the average warmest month April and average coldest, June. Also a tad difficult to see this as substantiation of insolation variation suppositions between both hemispheres. Anyway I substracted the individual monthly averages form the corresponding months and ranked again. Instead of #111, the unusual scorcing hot October 2008 is now ranking a whopping #115 out of 358 months. Not sure what you did but I suggest you do your math again because you're off by two orders of magnitude. I suspect you pulled the temperature anomalies data file, which has already removed the monthly averages, that's why your number is so small. Actual annual range for global average is 6.8F (3.8C). The global monthly temperature annual cycle is in phase with the Northern Hemisphere seasons because the North Hemisphere has a larger % of land area, hence continental climates and more extreme seasonal temperatures than the Southern Hemisphere which has more marine climates. It's got some other interesting data as well. Even without the surface data the satellites still shows the trends consistent with increasing greenhouse gases such as the increasing lower tropospheric temps(TLT)(though a bit smaller than the surface as expected) and decreasing lower stratospheric temperatures (TLS). (See Fig 7). Very interesting. Thanks for the info. No worries, we have it now, and can adjust our models, understanding, and predictions accordingly. You know, scientifically. i think the point Andre is trying to make is that, if there were gaps in the earlier models, how do we know they're that much better now ? what other significant factors may have been overlooked ? There are certainly factors that have been overlooked. But a flat trend now is explainable under our current level of understanding, as I understand multidecadal cycles, so to conclude that a flat trend is an argument against enacting carbon-regulation policy seems disingenuous. I do not know that Andre has said this here, I may be recalling comments from another thread or another board. Ok fair enough. Lets look at how the ancient 20 year old model held up. First I'll make the point that none of scenarios were very close for the combination of projected methane, Co2 or N2O--so it's a bit silly to compare results directly. But I'll forge ahead, hold my nose and cherry pick a bit and ask--which one predicted Co2 closest? Actual growth was +1.5ppm/yr, while it turns out that it's scenario C predicted average growth of +1.6ppm/yr. While none of the emission scenarios fit very well the one that fits Co2 the closest also happens to predicted the most realistic increase in surface temp (not shown in your graph but we'll go with the RSS line anyhow). Within the current weather regime even the crusty 20 year old model didn't do too bad for itself. The models today are even better. Actual growth was +1.5ppm/yr, while it turns out that it's scenario C predicted average growth of +1.6ppm/yr. Truth? there is no truth, these men make it up as they go along. Scenario A for 1.5% per year. Agreed, and Ya I jumped the gun by reading the wrong model...argg. I'm intellectually honest enough to admit a mistake. But what you're confusing (and it got me as well) ...is +ppm with % increase. Anyhow, the truth is all 3 scenarios called for 1.5% increase to start off with. That's a start for scenario A of about +3ppm for Co2 and it goes up from there. Just looking at ppm increases through the most accurate total rise for CO2 Assumption up through about 2006 is Scenario C.
NASA has made more than a few variations and improvements of similar models since. The doesn't mean there's nothing to learn from them however. For example, the recent NASA models reduce direct sensitivity to increased Co2. The bad part is aside from the pending world recession many countries aren't as of yet reducing their emissions and Co2 and other GHGs might grow faster in the future than any of our current projections. I hope I'm wrong about the faster growth in developing nations--not only for global climate by for the sake of sensitive ocean biospheres which can't survive the increasing acidity. I fear you are. China and India are growing at a very fast rate and nothing will stop their industrial dependancy of fossil fuels IMO. Africa, if it ever gets going, is yet another major contributor to AGW waiting to happen. :?